Today (Christmas Day 2013) I found myself singing this Christmas song from Hillsong “Born Is The King” and then reading Luke’s account of the nativity story (Luke 2) took me back to something I used to do every Christmas; that’s writing a Christmas message to myself. I thought to myself, very soon people from every tribe, language and nation will be worshipping a Jewish man sitting on a throne; in fact His great great grandfather David’s throne in Jerusalem, right here on earth. It was for this reason He was born a man. Wow…the root of David (i.e. the one who created David) is now the offspring of David (i.e. the son of David) Rev 22:16. Oh my goodness! I’m so fascinated by this God-Man. Not only did He choose to become a man for our sake but also chose to remain a man FOREVER. Wrap your head sound that. Would you agree that one day we will all be Jews?….NO/YES? No problem, read on to find out why I said this. I was thinking Jesus could have chosen to be born through any tribe or people but He chose to come through the Jews/Hebrews and for that reason He’s going to be a Jew forever. Jesus became the son of David (i.e. in the linage of King David ) all because of a promise God made to David. And as we know King David was a Jew; from the tribe of Judah. So why David? With David there are few reasons why but the main reason was also all because of a promise God made to His forefather Abraham. The Lord had said to Abram….I will make you into a great nation, and I will bless you;….and all peoples on earth will be blessed through you. Gen 12:1-3. And as we know Abraham (Abram) wasn’t a Jew. He was from Ur; from the people of the Chaldeans (a Gentile in a sense) Gen 15:7. He became the 1st Jew/Hebrew as some calls him because of the above promise and the covenant God made with him. Then the word of the Lord came to him: “… a son who is your own flesh and blood will be your heir.” He took him outside and said, “Look up at the sky and count the stars—if indeed you can count them.” Then he said to him, “So shall your offspring be.”….On that day the Lord made a covenant with Abram and said, “To your descendants I give this land…. Gen 15. So why Abraham…well that again was all because of a promise God made due to the mess Adam and Eve got themselves in when they disobeyed God. So why didn’t God destroy Adam and Eve and then start afresh. He did that again because of a promise He had made to Himself. I’m sure you getting my point; the reason He chose and did what He did with these people was all due to Him being faithful to a promise He had made even before the world was created. when man fell He didn’t restart all over again due to that same promise. He chose David due the very same promise. Then Jesus became a man to bring to fulfilment that very same promise. He really is the Alpha & Omega; He started this with Himself and He will end it with Himself. Everything/everyone else in between, is all to help bring about His promise to pass. Abraham the 1st Jew was not born a Jew but rather became a Jew because of a covenant (special relationship) God made with Him. Therefore Abraham descendants who were under the same covenant became known as the Jews/Hebrews (insiders), while those are not under this special relationship God made with Abraham are known as Gentiles (outsider). So Jews are Jews (insiders) only because of a covenant they have with God. If this is so then it can be said that not every Jew (i.e. being a physical descendants of Abraham) is actually a Jew (i.e. those who are under the covenant with God). Think about it…if someone is born of the Jewish people however does not remain under the Abrahamic covenant, then is He really a Jew? The answer is simply NO. Though he might have been born a Jew; he has become a Gentile in God’s eyes. This is exactly what Paul said in Romans 9….For not all who are descended from Israel are Israel. Nor because they are his descendants are they all Abraham’s children…..” In other words, it is not the children by physical descent who are God’s children, but it is the children of the promise who are regarded as Abraham’s offspring. And in the same way someone born as a Gentile can also become a Jew. Just as Abraham became a Jew. Because real Jews are children of the promise and not necessarily by physical descents. For part of the promise God made to Abraham in Gen 12 says “…all peoples on earth will be blessed through you.” meaning all people on earth will be under the same covenant/promise that God made with Abraham. This is why Jesus chose to come to earth through the Jews root specifically through the linage of David. To fulfilled a promise He made to Abraham by drawing all people of the earth under the Abrahamic covenant and promise. There is now therefore no need for anyone to be a Gentile (an outsider). Everyone who has receive Christ as their Lord and savior has been made Jew (child of the promise). For He is the offspring of Abraham who is the heir of the promise and He’s inviting every people, from every nation, tribe and language to join Him as co-heirs of that promise. There is neither Jew nor Gentile, neither slave nor free,nor is there male and female, for you are all one in Christ Jesus. If you belong to Christ, then you are Abraham’s offspring, and heirs according to the promise. Gal 3:28-29. This is why we will all be Jews one day, Jews not born into the physical linage of Abraham but Jews re-born into the spiritual linage of Christ; who has now become the offspring of both Abraham and David. So born today in the town of David, a Jewish King of The World; The Messiah. 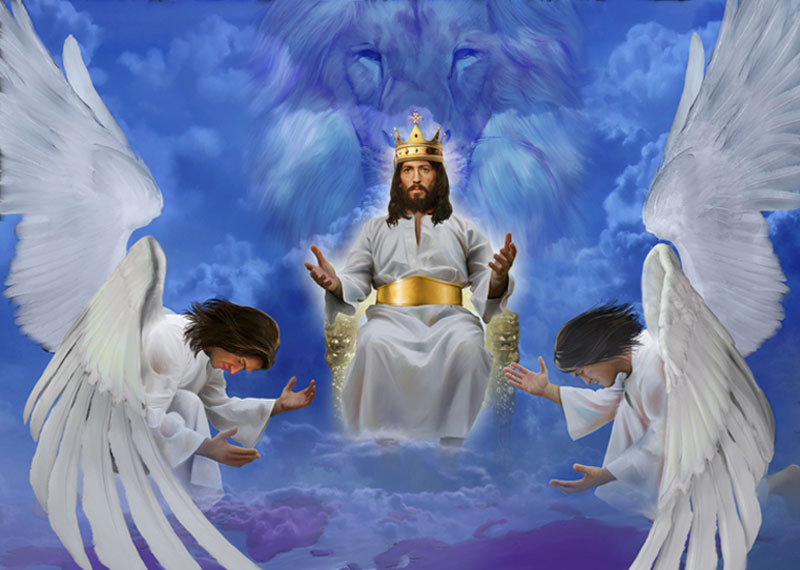 He is the root and offspring of David; the King of Kings & Lord of Lords, who will reign both on His heavenly and earthly father’s throne and will draw all people to Himself. To Him Be Glory and Power For Ever And Ever. Amen.